This might be the first bread I learned to make. I was practically a baby Yogurtsoda, obsessed with PBS’ roster of cooking shows in the 1990s. 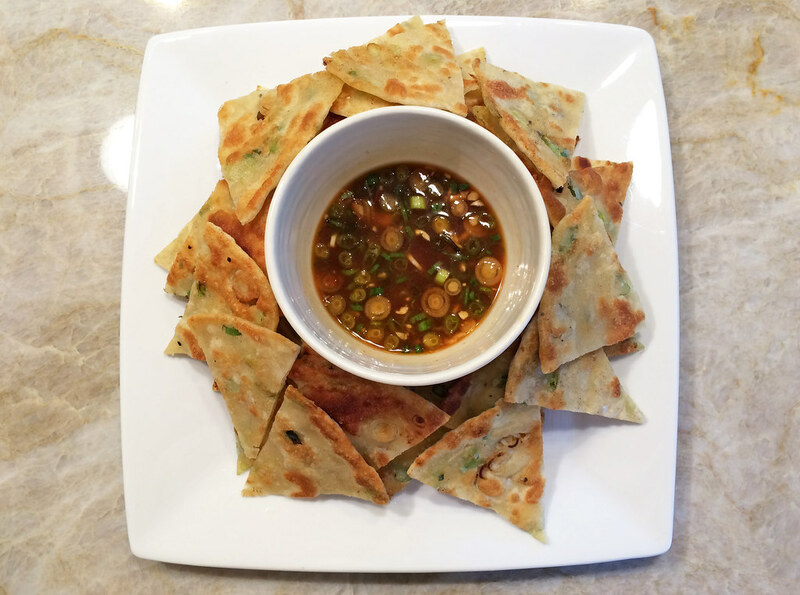 Martin Yan’s Yan Can Cook was one of my favorites and these chewy green onion pancakes looked like an irresistible snack, so I learned how to cook them. Rolling out the dough for this unleavened bread takes a bit of getting used to but once you get the hang of it, the rest is easy. The accompanying dipping sauce isn’t authentic, but it adds a deliciously savory layer of flavor to the final dish. 1. Place flour in a bowl. Add water, stirring with a fork, until dough holds together. On a lightly floured board, knead dough until smooth and satiny, about 5 minutes. Cover and let rest for 30 minutes. 2. Combine chicken broth, soy sauce, 2 teaspoons green onions, garlic, and chili garlic sauce in a bowl and set aside. 3. On a lightly floured board, roll dough into a cylinder, then cut into 12 portions. To make each pancake, roll a portion of dough to make an 8-inch circle about 1/8-inch thick; keep remaining dough covered to prevent drying. Brush with cooking oil. Sprinkle sesame oil, green onions, salt, and pepper on top. Roll dough into a cylinder and coil dough into a round patty; tuck end of dough underneath. Roll again to make an 8-inch circle about 1/8-inch thick. 4. Place a 10-inch frying pan over medium heat. Add 2 tablespoons oil, swirling to coat sides. Add a pancake and cook until golden brown on each side, about 4 minutes total. Remove and drain on paper towels. Add more oil as needed and repeat with remaining pancakes. 5. Cut pancakes into wedges and serve with dipping sauce on the side.